Acoustic Curtains are popular amongst many different Venues, Offices and Studios. They are designed to improve the overall sound in the room by reducing unpleasant noises caused by poor acoustics, echoes and reverberation. In order to maintain a good rate of absorption, Wool Serge is the fabric most commonly used. Furthermore, drapes can be multi-layered to improve absorption as well as the inclusion of interlining. 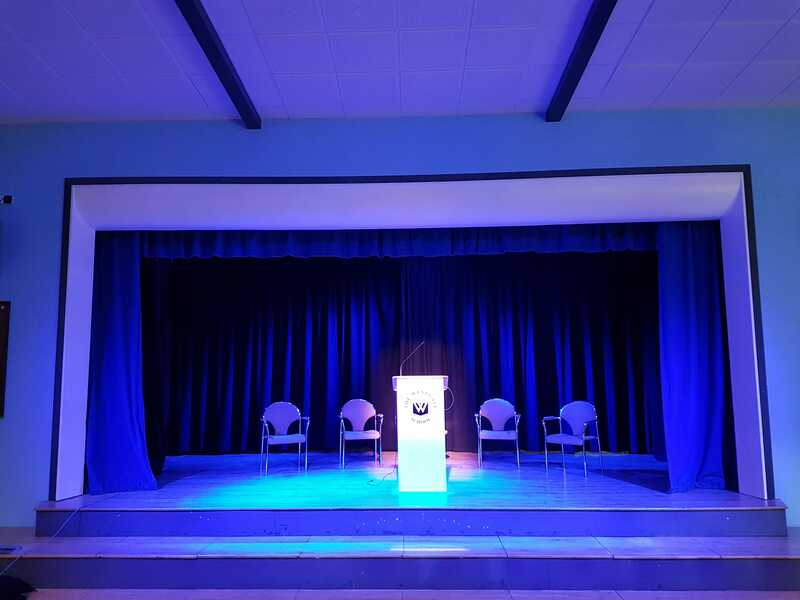 ”School Stage has provided the pupils and staff of The Winchcombe School with a high quality interactive sound & lighting system which offers flexibility in its use and provides a large teaching and learning zone for the school and the wider community. The school hall is used for a variety of activities, assemblies, school productions, discos, INSET training, and the flexibility afforded by the sound and lighting equipment provided by School Stage works really well for us. The equipment is user friendly so both staff and pupils are able to use it and it is not too onerous to set up. The hall is a large area with a numerous windows to one side and at high level which proved a very difficult space acoustically. In the spring of 2018 the hall was fitted with acoustic curtains to the windows, and to the front and rear of the hall. The difference in noise levels was immediate and we now have a fantastic space in which to present school plays and concerts which is acoustically sound. The local choir which uses the space to rehearse is equally delighted. The service provided by School Stage is excellent and I have no hesitation in recommending the company to other schools and companies.